Will not bolt onto factory H-pipe. Does bolt directly onto a BORLA cat-back exhaust system (p# 140371, 140370, 140372, 140389, 140514, 140515, 140516) or BORLA X-pipe p# 60513. These long tube headers have 1.75" Primary pipes and 2.75" merge collectors. 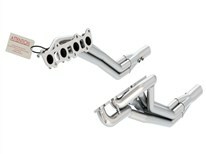 The catalytic converters are removed when using these headers. These headers are for competition use only and are designed to be used with vehicles equipped with extensive performance upgrades. This is a race header and not recommended for emission controlled vehicles.